My Father Cigars reports that they have 700 employees, but there is nary a typist among them. Okay, I’m speculating about that last bit. Perhaps there is another reason why their website is so attractive and yet barren of content, but I’m fond of the notion that it is due to a paucity of secretarial skills in the workforce. Those 7000 dextrous digits are kept away from all keyboards and directed instead to the rolling gallery of the Garcia Family Industrial Park, where they are producing some of Nicaragua’s finest smokes. Soon after the My Father line of cigars was introduced in 2008, the Cedros Deluxe line was added in the lonsdale and corona gorda sizes, called Cervantes and Eminentes respectively. At first glance it’s difficult to see why the cedar is necessary because the regular My Father line is an impressively rich cigar to begin with. I guess cedar is like cowbell — more is better. Due to the lack of information on this cigar I’m going to hazard a guess that the composition is the same as the standard My Father line — a blend of Nicaraguan fillers and binder (grown on the Garcias’ La Estrella farm in Esteli) and a Habano-Criollo hybrid wrapper from the Oliva Tobacco company in Ecuador. The stamped cedar sleeve on the My Father Cedros is an attractive aesthetic feature as well as a flavor enhancer, and the fact that it slides off so easily is pleasing as well. The wrapper is a ruddy colorado maduro with some fine veins and a touch of oil. 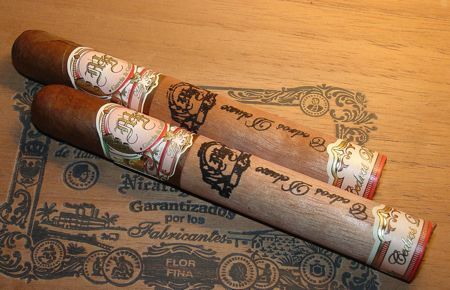 As expected, the roll and the finishing touches at the head of the cigar are precise and refined. The Cedros version seemed to burn a little bit faster than the No. 1, but it also seemed lighter to me, so maybe the proportion of ligero to lighter more combustible leaf is a bit different here. The Cervantes burned beautifully and exhibited in all other respects excellent construction, even exceeding the high quality of the the No. 1. The cedar lends a sweet character to the smoke that blends well with an earthy and tannic flavor on the palate. A caramel-like quality shows up after an inch or two as the pepper relaxes. 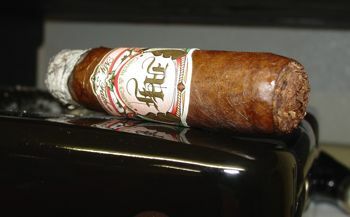 The second half of the cigar develops more complexity as leathery flavors overtake the earthy ones. 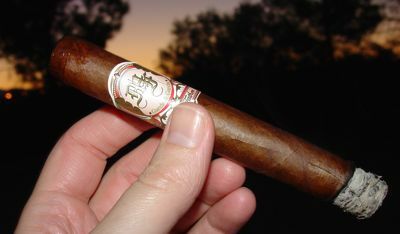 The smoke remains quite smooth and easy going, about medium in body and strength. The sweet cedary notes turn a bit darker. At one point I detected coconut, which might be attributed to environmental factors, like smoking in the waning hours of a summer day that pushed the mercury to 114 degrees. At the band the flavors start to char a bit and I’m ready to seek psychiatric assistance, or at least to go inside and cool off. The My Father Cedros Cervantes is a slightly milder and more aromatic version of the My Father blend. I’m not sure if that is due to the size or if the blend has been tweaked for the Cedros Deluxe, but either way it suits me fine. It’s smooth and laden with cedar sweetness in balance with leather and earth. Though perhaps not quite as complex as the No. 1, it’s well worth smoking as a medium-bodied alternative. Pricing is about the same, unfortunately — around $8-9 per stick. But in this case it’s worth the expense. Thanks for another great review, Tom. I have to admit that the only My Father I’ve had is a single LB 1922, but this sounds like a nice one to have. I love the DPG Blue Label with some age on it, by the way. I’m not crazy about the LB for some reason. Only smoked one though, so I should give it another chance. I’m working on a DPG Blue “Aging Report” though, so stay tuned. And speaking of bananas, there were chimpanzees running loose in my neighborhood yesterday. I guess the heat is getting to us all. I agree — I think the extension brands are distinct enough that they deserve their own names. Maybe next time they will ask for our opinion. (But I doubt it!) Long ashes, CP.